Targets in Cloud Databases can be managed using either the Target Manager or the Vuforia Web Services API. Cloud Databases are hosted by the Vuforia Cloud Recognition service and provide a way to recognize up to more than 1 million target images. You can create Cloud Databases in the Vuforia Target Manager by following these steps. Name the databaseand select the Cloud Database option. The database name should be unique for the developer account you are using. Note that licenses keys can only have one Cloud Database assigned to them. Image Targets can be added to a Cloud Database using either the Vuforia Target Manager or the Vuforia Web Services API. 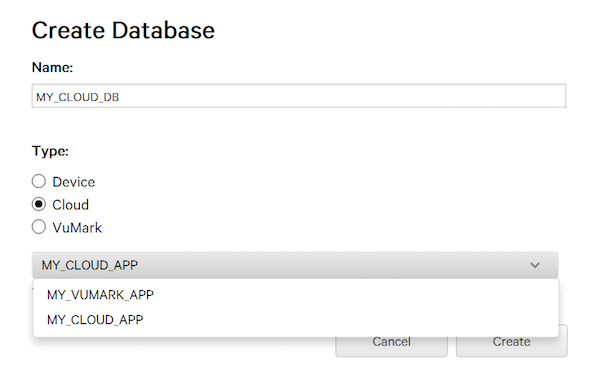 Go to the Target Manager page.You will see a list of existing databases listed by name and database type. In the list of databases, find and click the name of the Cloud database that you want to add a target to. In the Add Target dialog, define the name and width of your target. Note: Developers looking to use Cloud Databases in combination with Positional Device Tracker should specify the target size in meters. Upload the target image and optionally a metadata file. Click the Add button to create a new target in your Cloud Database. Your target will become active after a short processing interval. Click the name of the database containing the targets that you want to remove. You'll be presented a list of targets in that database. Click the check box next to the targets that you want to remove in the target list, or check the box next to Target Name to remove all targets. The App Name of the app to which the database is assigned. The total number of targets in the database. The date the database was last modified. Go to the Target Manager page. Click the Cloud Database name containing the targets you want to view. This will take you to a page listing any targets in the database. The Augmentable Rating for any targets. The target status of Active, Inactive or Pending. Click the Target's name in the target list.